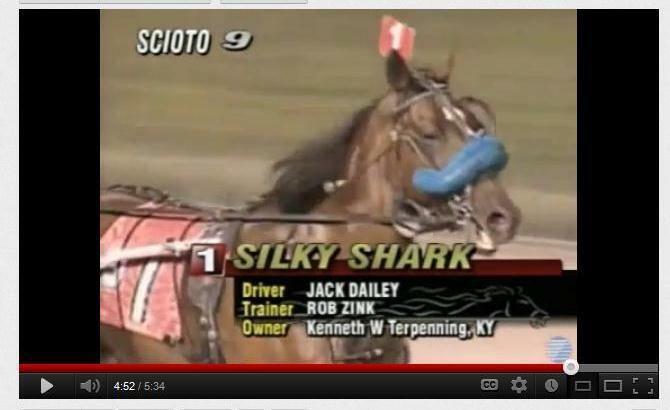 As the world, and especially the horse world, watches as the horsemeat scandal unfolds in Europe and the U.K., the CHDC is reposting “Proof of CFIA Failure“, the story of Silky Shark, a Standardbred racehorse who was slaughtered and slipped through the system to dinner plates, when his carcass should have been condemned due to phenylbutazone contamination. Canada’s Bloody Secret is that this country enables the mass brutality and inhumane treatment of both US and Canadian horses. Why, because it is multi-million dollar industry, fueled by greed and a total disregard for life. The US banned their own equine slaughter plants many years ago, so Canada took up the opportunity to make money by importing tens of thousands of US horses destined for slaughter and horsemeat exportation to Europe. 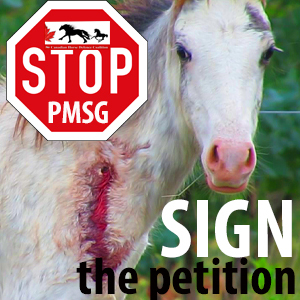 Our own wild horses face the same total disregard and what few wild numbers are being exterminated because they have no protection and are considered feral vermin. Retired racehorses, competion horses are all now part of the growing horse meat industry. With McGuinty’s closure of Ontario racetracks that number of equine victims has increased, these horses contain toxic medicines administered during their racing and competitive careers that make the meat unfit for human consumption. The EU has already launched a full scale investigation into consumer fraud against companies within the EU that have failed to advise consumers that horse meat is often the prime ingredient in their products. Regardless of the contaminants, horses continue to be exploited by any and all means possible at the hands of the greedy, self justified pro-slaughter advocates, who disregard the legal lands given to and what little protection there is for horses across the US and Canada. Canada continues to bloody her hands and will continue to do so on this issue, just as she stains herself with the blood of murdered seals and by importing cat/dog fur products from China. Until such time as Private Members Bills that are brought before the House of Commons demanding increased and strengthened Animal Protection Laws for this country no longer get defeated in their Second Reading (and there have been so many) nothing will change in this country. It is a total ongoing disgrace period!!! Shameful to a degree that cannot be described in words!! Hidden tragedy of horses forgotten? The current food scandal is shocking, if nothing else, for revealing the extent to which horse meat has fraudulently made its way into processed meat products labelled “beef”. It turns out that horse meat is so ubiquitous that UK government ministers now talk about an international criminal conspiracy. The scandal has been met by popular outrage. The serious debate has focused on how a profusion of horsemeat got into the food chain and who’s to blame. But in all of the debate, it seems we’ve forgotten the welfare of horses themselves. I fear for them. How were they treated? How did they die? These horses are often not bred for food. They are mostly surplus animals who end up as meat. Their lives often start out as pets, or as working animals on a farm, or as race horses. When they become unwanted and unloved, their financial value drops and their meagre worth is determined by how much profit can be extracted from their carcasses.
. Let’s look at what we know. There’s an international trade in horses and horse meat that is worth millions. Huge quantities of horse meat are routinely imported into the European Union. The Humane Society International recently investigated the international trade in horses. They found that this trade is not just in the EU but also Canada, the USA, Mexico, and some South American countries, including Brazil, Argentina and Uruguay. Presently, Canada is the largest exporter of horse meat to Europe. But most of the horses slaughtered in Canada and Mexico are born and raised in the USA and are forced to endure massive journeys to Canadian and Mexican slaughterhouses. An international trade in horses in North and Central America such as this raises important questions about the welfare of horses in long distance transportation and slaughter worldwide. For example, within the EU, horses, along with sheep, cattle and pigs, are transported from Spain to Italy for slaughter. This is a journey of some 2000-2500 km lasting about 35 hours or more. The animals can suffer from hunger, dehydration and exhaustion, as well as heat stress, injuries and death, if they’re not provided with adequate food, water and rest. There may be overcrowding in the vehicles, which do not always provide sufficient headroom for horses. Our investigators followed a truck transporting horses from Romania to Italy. They found the drivers broke an important EU regulation by not providing these animals with water. Every year more than 30,000 horses are transported from Central and Eastern Europe to Italy for slaughter. Just imagine being pushed and pulled into a truck, standing for hours on end, without water or a chance to rest. It is proven that horse welfare deteriorates after 8-12 hours of transport. Yet, in our investigation, the horses loaded first onto the truck endured a horrific ordeal of more than 26 hours. The horse meat scandal gives a glimpse into an under-regulated and out of control industry. What else don’t we know about our food? I shudder to think how the horses were killed. I cannot help asking, why is no one talking about their welfare? We need an urgent inquiry together to halt the widespread haemorrhaging of the food system. Proper traceability, transparency and enforcement of rules could have prevented this problem. The horse meat scandal exposes wrongdoing in our food system. Compassion consistently exposes the fact that animal welfare laws are routinely ignored across Europe. For how much longer will our political leaders allow this to happen? It’s time to fix the broken food system, and fast; for the sake of the food on our plates, the safety of our society and for the welfare of the horses killed behind closed doors. You can help make a difference for these horses today! Does anyone have e-mail addresses for EU or Humane Society groups in Europe??. Now would be the perfect time to flood them with information on what goes on with horse slaughter in Canada in regard to drugs and lack of tracing ability. Harper could care less as long as money is made. Please contact Humane Society International European Union as they are working to ban import of horsemeat from Canada and Mexico….they have several press releases that pertain to our Canadian Horses. Sinikka, If the CHDC has ” proof” and we have ” hard scientific evidence” that BUTE is carcinogenic ,cannot we somehow take the CFIA ( Canadian Food Inspection Agency ) to court for dereliction of duty, professional malfeasance, and endangering public health and safely! We could contact Nick Wright perhaps of Animal justice in Toronto for some initial advice and counsel? As much as I am infuriated by all of this, I would like to direct this anger about horse slaughter and “do” something that would actually shake the whole rotten to the core criminal brutal horse slaughter profit mongers TO THEIR CORE… and this country!!! We need this kind of panic to happen to Harper and his cronies and the CFIA They have got away with “murder” for way TOO LONG ! Canada is way TOO PASSIVE about animal cruelty!!! I am sick of it! CFAWR will do everything and anything we can to help! COUNT ME IN! A DISGRACE IN EVERY WAY IMAGINEABLE ……. ← Petitions and Pins Wraps Up Today!